Federal employees earn 22% more than their comparable private sector counterparts. Federal employees voluntarily quit 67% less than their comparable private sector counterparts. 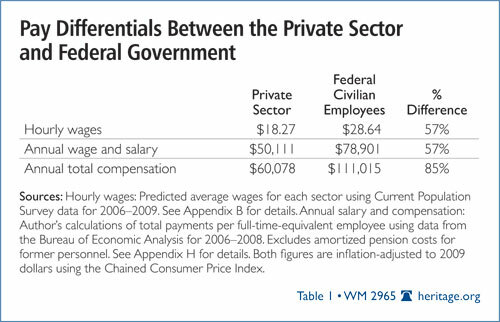 To read the entire report, click on Comparing Pay in the Federal Government and the Private Sector. From December 2007 to June 2009, the U.S. federal government added 192,700 jobs. In December 2007, the Defense Department had 1,868 civilian employees earning $150,000 or more. In June 2009, the number increased to 10,100. The average federal worker earns $71,206 annually, compared to $40,331 in the private sector. To read the entire article, click on For feds, more get 6-figure salaries.